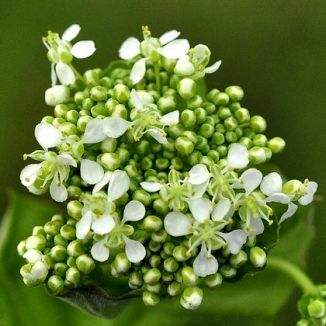 Hoary Cress is not easily confused with other wild plants on this web site. This is a perennial wildflower which grows on disturbed ground, field margins and roadsides, in large patches, the top of the plants reaching to about 60cm. On erect stems, large numbers of pleasantly scented, tiny, white flowers (5-6mm across)are held in frothy, flat-topped clusters. They bloom from April to October. The leaves, which are greyish,are lanceolate, sometimes toothed, and they clasp the stiff, upright stems. Both leaves and stems are covered by a very fine down, not quite hairy, but not smooth either. This is not a native plant and it belongs to the family Brassicaceae. I first recorded and photographed this plant in 2009, growing on the North Bull Island, Co Dublin. Hoary Cress is reputed to have been introduced into the British Isles in 1809 by British soldiers returning from a failed campaign in the Netherlands during the war against Napoleon's empire. 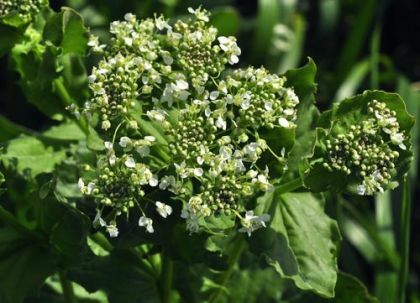 The seeds of the Hoary Cress had been in the filling of the mattresses of the returning soldiers and it didn't take too long before the plant became a serious issue for agriculture. In the Flora of County Dublin (1904), Nathaniel Colgan, describing it as an alien, recorded it as 'A casual on the Midland railway beyond Liffey Junction' and 'in fair quantity in waste ground by the East Road, Dublin Harbour, 1903' adding 'No doubt originally introduced with grain; now fully established'.